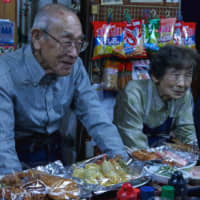 After surviving as a prisoner of war in Krasnoyarsk, Eastern Siberia, Toyokazu Matsubara taught himself to cook and opened up an izakaya bar-restaurant, Kurasuno, which has become a multigenerational family enterprise and beloved neighborhood treasure. 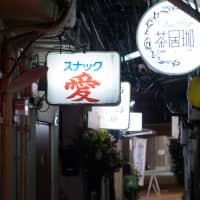 Jigokudani (Hell Valley) is a hidden labyrinth of about two-dozen small bars and restaurants near Noda Station in Osaka's Fukushima Ward. 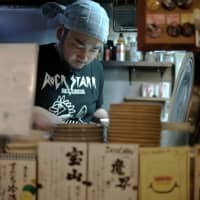 At Calayer, a curry restaurant that pays homage to thrash metal band Slayer, chef Takahiro Kubo prepares innovative, constantly changing curries for meat-lovers and vegans alike. 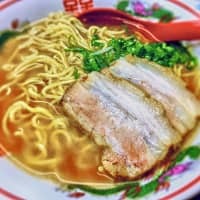 At Osaka Hanten, Hisao Tanaka's mission to provide hearty meals at affordable prices comes from the chef's past experiences with hunger. The origin of tachinomi can be traced to the Edo Period (1603-1868), when sake shops started offering customers a quick tipple from square wooden measuring cups known as masu. Since then, they have become neighborhood institutions.